Kia Motors tells us that its all-new production model, the Kia Soul, will be marketed globally with a choice of three highly efficient engines (depending on individual markets ), when it goes on sale in early 2009. The most powerful engine will be a 2.0 litre petrol unit. A smaller capacity 1.6-litre petrol engine will be offered in most countries. Very important is the fact that a 1.6-litre diesel engine featuring a VGT (variable geometry turbocharger ) will also be in the range. Both the 1.6-litre, four cylinder, 16-valve DOHC power units are based closely on engines fitted to the hugely successful, European-built, Kia cee’d. Kia has also confirmed that the new model will be available exclusively as a five-door hatchback with front-wheel drive. It will be manufactured in Korea from November 2008 for overseas markets. Kia say that the new Soul will defy conventions and appeal especially to the young and the young-at-heart – whatever their age. Kia Soul is not a replacement for an existing vehicle and Kia says that it is destined to play a unique role within it’s global product line-up. Kia Soul will provide a creative platform for buyers to individualise and match their car to their own personality. 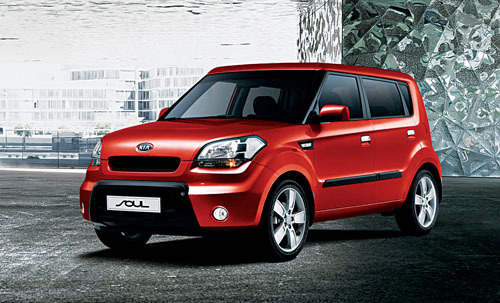 The World Premiere of the Kia Soul will be celebrated on October 2 2008 at the Paris Motor Show. The exciting new Kia model is scheduled to go on sale in Europe during February 2009.